Are You Tired Of Learning The Hard Way? Perhaps your relationship feels like an uphill battle at times. So, if you want to do well at the long-term relationship game, it's important to know the most common pit falls, traps, and mistakes that couples make that destroy their relationship. This way you can avoid ongoing frustration and be ahead of the game, mastering the dance of relationship. Jayson Gaddis's favorite thing to do is help people resolve conflict. He's spent over the past 2 decades in a variety of settings studying human behavior and why people struggle to understand each other. 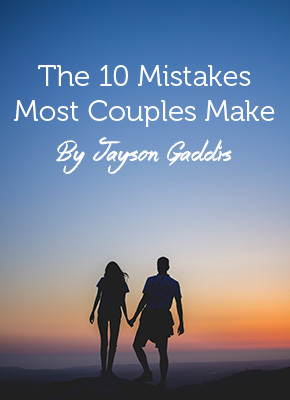 His own life has been full of endless failures and victories so he wants to save you time, money, and energy by learning about the common mistakes in marriage, so you can love bigger. He teaches virtual relationship empowerment classes to students around the globe.